MACAO, MARCH 4, 2014 – Best Buddies International, a groundbreaking nonprofit founded in 1989 by Anthony Kennedy Shriver to establish a global volunteer movement that creates opportunities for one-to-one friendships, integrated employment and leadership development for people with intellectual and developmental disabilities, is pleased to announce that the Venetian Ball 2014: A Night of Glitz and Glamour will take place at The Venetian Macao on Saturday, March 15. Best Buddies Peru was initiated in 2009 under the umbrella of Asociación Proyecto Inclusión Perú (APIP), an association founded by parents of individuals with intellectual disabilities with professionals and friends who want to promote educational and social inclusion in Peruvian society. After much hard work, the pilot chapter at University of San Ignacio de Loyola was launched on September 18th with a volunteer training followed by the matching of the first Best Buddies pairs in Peru. We were introduced to Best Buddies by staff member, Valerie Vitale, when she was in Peru visiting her family. A mutual friend arranged for us to meet. This friend thought it would be a good introduction because our son, Bryan, who has Down syndrome, had become a catalyst for our family to advocate for social inclusion since his birth. Since then in Peru, there have been many advances in education and inclusion in the classroom, but there is still a lack of social inclusion in the day to day lives of people with intellectual disabilities. After learning more about Best Buddies, we knew immediately that this model would present a wonderful opportunity to bridge this gap to social inclusion. After some time passed, we thought that Best Buddies would be perfect fit for Asociación Proyecto Inclusión Perú (APIP). I was overjoyed when the other members of APIP agreed that Best Buddies was a project they also wanted to take on. In July of 2009, Maritza Noya, President of APIP and I attended the Best Buddies International Leadership Conference in Bloomington, Indiana. We came back more enthusiastic than ever and started working very hard with members of APIP to make Best Buddies Peru a reality. We know the road ahead will not always be smooth but we are very confident that Best Buddies Peru will grow and play an active part in promoting social inclusion in Peru. Best Buddies Curaçao was launched in 2008 under the umbrella of Totolika, an association for parents of children with disabilities. Arthur Nivillac, Project Coordinator for Best Buddies Curaçao, participated in the Best Buddies International Leadership Conference that same year and during the conference, Arthur witnessed his student leader Christopher Nelson, embrace the Best Buddies mission. Upon witnessing this, Arthur was confident that the project would be an excellent fit in his native home of Curaçao. With a population of less than 150,000 people, Curaçao has 4 chapters in High Schools and Colleges making friends and making a difference. After their first year of being matched, the friends came together for a party to say good bye. Many of the Peer Buddies were off to continue their studies in the Netherlands. It was very emotional because the friends had become so close over the course of the year. As the new school year begins and the chapters reconvene, new frontiers of friendship lie ahead. As they say in Curaçao – No tin riba un amigo: there is nothing better than a friend. Best Buddies Panama: ¡Grandes Amigos! 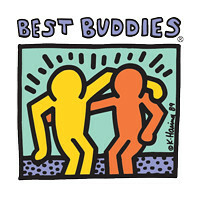 Best Buddies Panama was launched in 2008 in Panama City with the support of Fundación Caminemos Juntos. Their High School chapters have generated interest from corporate entities, such as Audi Latin America, and influential members of the Panamanian Government. In July of 2008, their inaugural event honored the then-First Lady of Panama, Vivian Fernandez de Torrijos, with the Spirit of Leadership Award for her admirable work to further integrate people with intellectual disabilities into Panamanian society. With over 200 guests including the former President Martín Torrijos, Best Buddies Panama was introduced on a grand scale. Executives from Audi, as well as Anthony Shriver, were also in attendance. Internationally-renowned Panamanian artist, Olga Sinclair, created a painting that was auctioned at the event to raise funds for our new programs. However, the spotlight of the night shown most brightly upon the Best Buddies pair that spoke about their experiences with the program and warmed the attendees’ hearts with the laughter of their friendship. This auspicious beginning has joyously led to vibrant current program chapters, which continue to attract the energy of volunteers and supporters alike. Best Buddies Panama is indeed a program that is most worthy of their Panamanian title of ¡Grandes Amigos! Best Buddies Korea was established on February 14th, 2010 under the management of Ai Corea. The volunteers from Ai Corea Hankuk YukYoung School and Daewon Foreign Language High School form the first pilot chapter of Best Buddies Korea. They focus on activities that provide opportunities for volunteers, with and without intellectual and developmental disabilities, to have everyday experiences with a friend that they would not have met had it not been for Best Buddies. From this first chapter, Best Buddies Korea plans to extend programs to middle schools and high schools all over Korea. Ga Yung Suh, a peer buddy, shares her experience with her Buddy and her recent trip to the Best Buddies International Leadership Conference in Bloomington, Indiana, U.S.A.
My buddy, Seong Hyuck, is a senior boy one-year older than I. When I first met him last March, I felt little bit afraid because he didn’t make eye contact, ignored my questions, kept looking for food, and even took my cell phone that was in my pocket. Also, when I tried to make contact with him by text messages and phone calls, he gave me no answer. Since then, we have come a long way. We’ve become closer friends, doing lots of different things together: making ceramics and cakes, going to the movies and playing soccer, to name a few. Whenever we get together, I can see changes in Seong Hyuck. Now he often makes eye contact when I’m talking, says hello to me, and remembers my name. The last time we went out, we went to see Toy Story 3. When we met at the first floor at the theater, he came to me and shook my hand with a smile. His changes are really small that only I can recognize, but I feel really thankful and want to be his Best Buddy. Because of the experiences I had with Seong Hyuck, I was eager to learn more about Best Buddies, so the opportunity to go to the Best Buddies Leadership Conference in the U.S. was something that I was very excited about. It turned out, unfortunately to be a really long and harsh trip to Indianapolis with multiple unexpected delays. However, once we finally arrived and shared three unforgettable days with lots of new friends from all over the world, I knew I had been greatly influenced and that through me, the rest of the members of Best Buddies Korea would be influenced and inspired as well. Since Best Buddies Korea is very small and has only one chapter and 8 pairs, I felt a great responsibility to learn from other chapters and countries. General and international sessions were really helpful and essential for Best Buddies Korea, but some cultural differences weren’t negligible. My director, Mrs. Suh, and I realized that as a new program we need to continue to work with the Best Buddies International staff to further develop our strategy of running the Best Buddies in a way that is compatible with the culture of Korea. At the conference, I was surprised by the popularity of Best Buddies program in the U.S. We plan to one day grow and extend the Best Buddies program all over Korea. I wish other members of Best Buddies Korea could have had the opportunity to feel the energetic atmosphere of the conference and learn lots of things to improve our program. Thank you to Best Buddies for giving me this great experience. Esteemed Pop-artist Romero Britto, a native of Brazil, has been a most generous supporter of Best Buddies International. Over the years, he has created multiple works of art with Best Buddies in mind, together with the goal of furthering the Best Buddies mission of friendship, jobs and leadership development for people with intellectual and developmental disabilities. His memorable cycling-rider jersey designs for the Audi Best Buddies Challenges: Hearst Castle and Hyannis Port, are consistently sought after by participants and supporters around the world. In honor of Anthony’s late mother, Romero newly created the iconic logo for the inaugural Eunice Kennedy Shriver Challenge scheduled for October 23rd in Washington, DC. Moreover, Romero also created the Friendship Bear to celebrate the importance of these experiences among friends, as well as the positive impact that a true friend can have upon another’s life. Beyond the vibrant works of art that Romero has created, Romero’s friendship with both Alina and Anthony Shriver, as well as his knowledge of Brazil, was the impetus that directly helped bring the Best Buddies movement to Sao Paolo in 2007. Our pilot program at Colégio Pauliceia has been a consistent reminder of the power of volunteerism, youth ideals, and these one-to-one friendships. Romero continues his extraordinary support of Best Buddies – in the United States, overseas and Brazil in particular – and once again he has recently contributed by invigorating and attracting a new measure of local support for our growing programs within Brazil; which will advance our objective to ultimately realize Best Buddies more comprehensively throughout the country. Best Buddies Extrakompis, which means Extra Friend in Swedish, was initatiated as a pilot study in 2007 by Misa AB, one of the leading supported employment organizations in Sweden. At Misa AB’s core is the belief that people with learning disabilities and people with autism spectrum disorder, with the right support, can find great success and fulfillment in employment. Having employment itself can contribute to better socialization, but Misa AB also had the foresight to understand the importance of one-to-one friendships and how they can have a positive impact in the development of the social skills necessary to navigate the workplace community. Equally as important is the opportunity Best Buddies offers to change the communities where it exists by creating a more inclusive society. In the long run, this will lead to the sensitization of employers and creation of more employment opportunities for people with disabilities. Following the success of the first Best Buddies Extrakompis Citizens pairs, the amount of volunteers interested in joining Best Buddies has been more than encouraging. We will see great things from the partnership of Extrakompis and Misa AB. Still being a young organization in Sweden, Extrakompis aims to grow their volunteer and sponsorship base as they look forward to soon becoming a strong contributor to improving the living conditions for people with disabilities while having some great fun on the way.